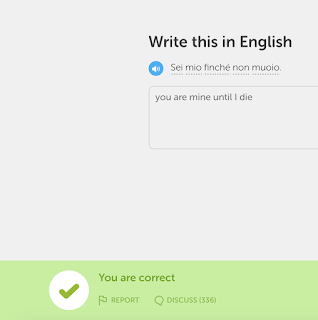 You are mine until ... what? 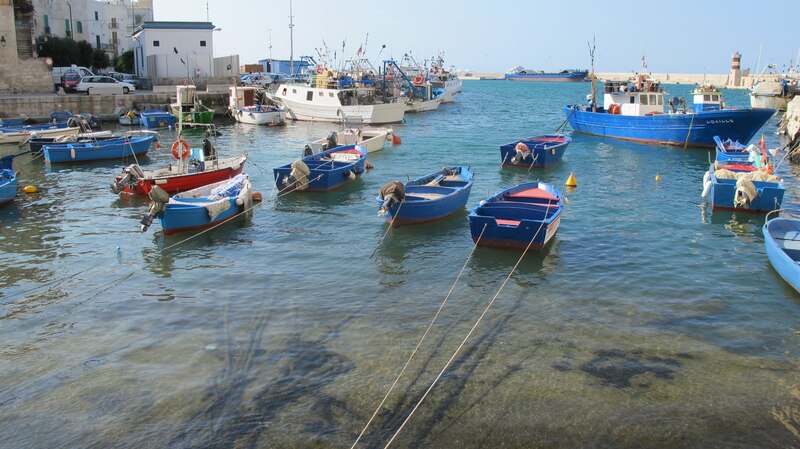 I had made it to Sicily by train and the journey had already had all the hallmarks of 'one of those trips' that would be recounted and exaggerated with each telling. There was just one more ferry ride across the water to Malta and my final destination, but my boat was not leaving until after night had fallen and that was hours away. 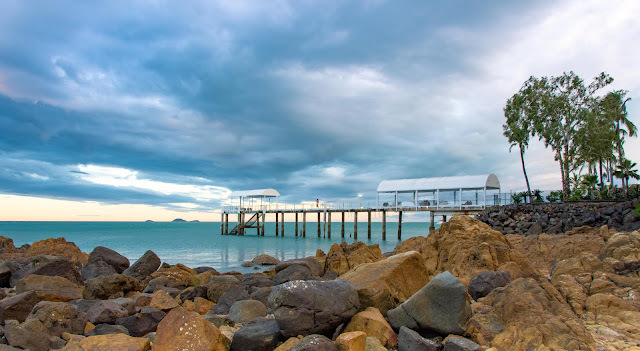 My unwieldy backpack was heavy plus it was relatively warm despite the winter season and I had not slept properly for days, so I sat on one of the chairs outside a wharf café hoping not to be noticed immediately and gazed out to sea. I was not alone for long. He was up for a chat but we didn't really have a common language. The words of Italian that I knew were fewer than the bits of French that he was trying on me but the gestures, the intention of his regard and his intonation were clear. Humour was my first dissuasive tactic. That didn't work, but neither did long silences, a firmer tone or suggesting that my boyfriend could be along at any minute. Despite the daylight, I was becoming more and more uncomfortable, but grabbing my hand and declaring that "my blood is boiling for you" had me guffawing uncertainly, snatching my hand from his and standing abruptly. 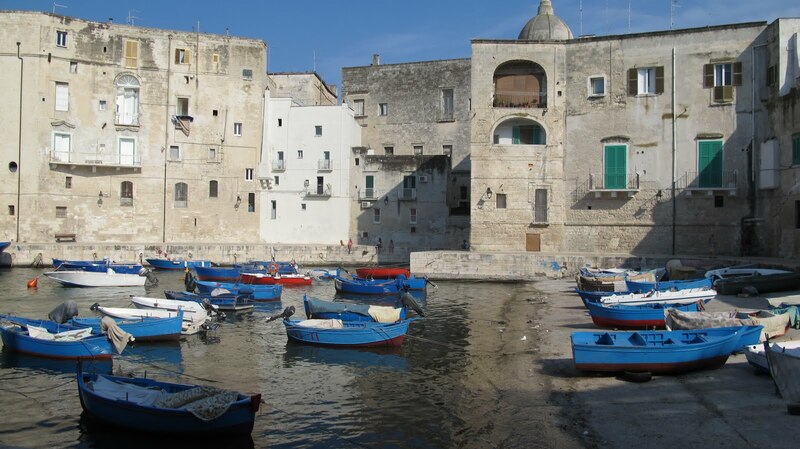 From the comfort of my desk today, I was transported back in time and to this Italian port scene. I had to translate this passionate statement from Italian to English, English to Italian and repeat it aloud over and over. I know that I don't yet know much in Italian and that finding creative, new sentences can be a challenge for an educator, but I did wonder if this were really a necessary addition to my beginner's repertoire? Perhaps it is just a precursor to Valentine's Day? I suspect not. Actually, it is quite liberating, quite exciting and in contrast to the conservative, polite nuances of my growing up in English. 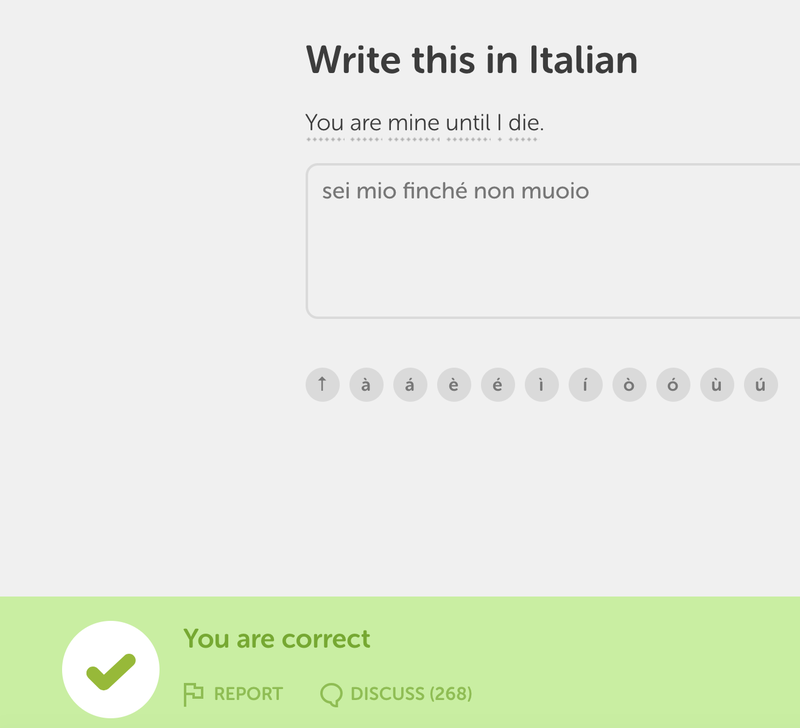 PS I was struggling with grasping the word finché (translated as until) followed by the word non until I looked up the Italian-French translation which read 'aussi longtemps que'.... You are mine as long as I am not dead. 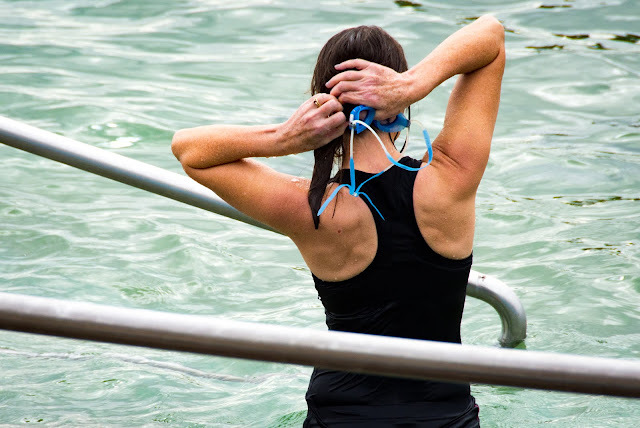 I can swim far not fast and even though I have been told that my style is questionable, it gets me through the water and unquestionably helps me to feel better about both myself and the day. 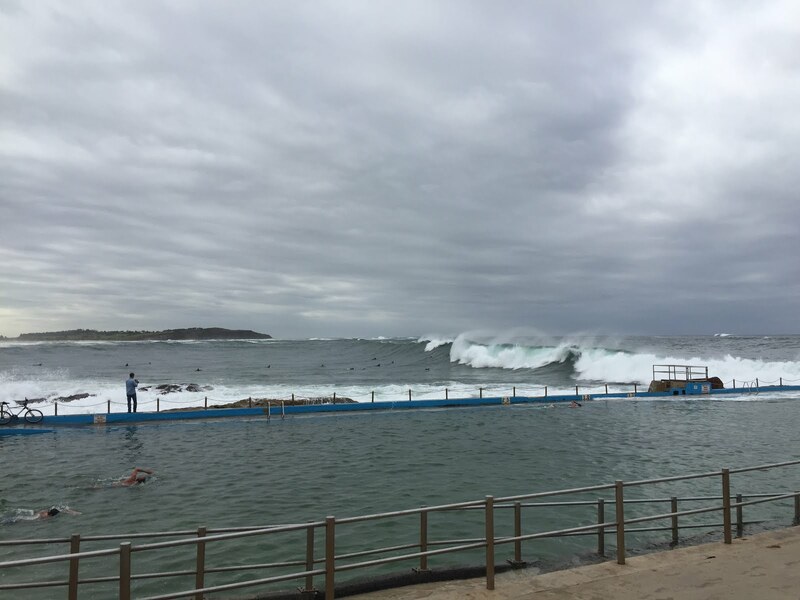 I dropped my son at the bus stop this morning and headed to one of the three ocean pools within a couple of kilometres of home. Arriving when I did, just after 7am, I was hoping to beat the majority of the early daily lap swimmers and find myself a quiet little lane. Out of luck, and concentrating on avoidance, I didn't get my usual self-induced, contemplative session. That is probably not the only reason, though, that I am still a bit out of sorts. This day, February 5, like September 8 and a few others in June and July for different reasons, always starts with some melancholy. My last year's February 5 post explains why in more detail. Coincidentally, this beach, where I swim now on a regular basis, was the first that we came to after our return to Australia. 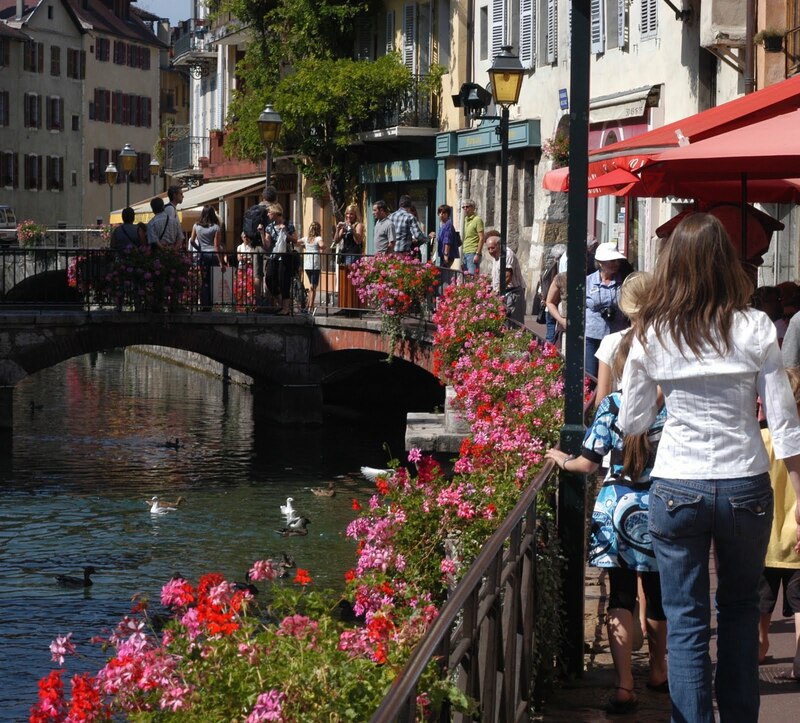 We were pale, hot and disoriented and, as it had been on arrival in France years before, I was concentrating so hard on working things out in an unfamiliar environment that my goal was more about getting through each day than relaxation and enjoyment. The day after this first beach visit, my husband suggested that we head out for dinner in Manly to celebrate my birthday. I was reluctant, probably still jet-lagged, and definitely still emotional from the exercise of packing up and leaving behind our French lives, but agreed all the same. I dressed as I would have to go out in France; nothing too fancy, but when we arrived at the beachside restaurant strip, I felt horribly conspicuous. I wasn't wearing a sundress and thongs or shorts and a t-shirt and when I opened my mouth, the only words that wanted to come out were in French. 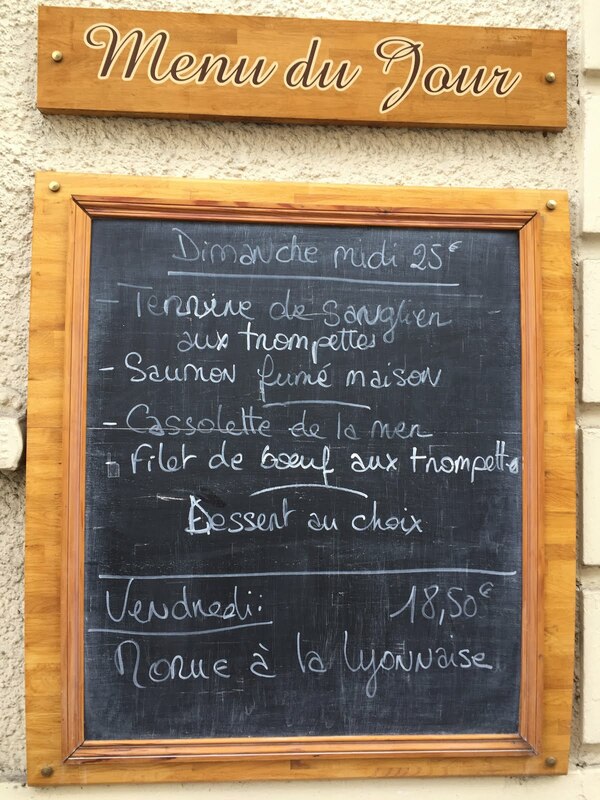 I don't remember if the food tasted good and was well-presented, nor if the waiters were friendly and attentive. 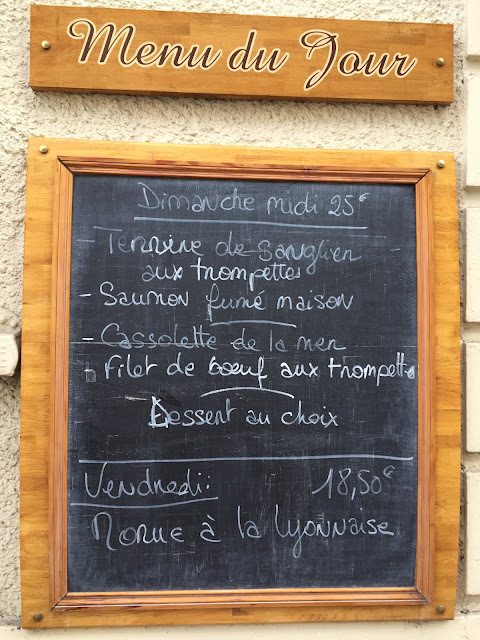 On the other hand, I do remember registering that the food was amazingly expensive compared to our French menus du jour. Time helps with reconciliation, and I have grown to appreciate, even love, the coastline that we are lucky enough to live next to with the opportunities that it affords us. Sometimes, though, it takes a different perspective to click me out of a self-imposed mindset. One of my moments of externally prompted introspection came recently when in Melbourne. I caught up with a girlfriend who was a big part of my life before we left for France. We talked at speed as we had a lot to catch up on, but it was when she commented 'that the pre-France Catherine would be so pleased if she had known to anticipate the ten-year-down-the-track Catherine' that I teared up. Maybe I could have done more ... done differently, but her words remind me that what I didn't know, has ultimately helped me to grow. After swimming recently, I took a few extra moments to look around. 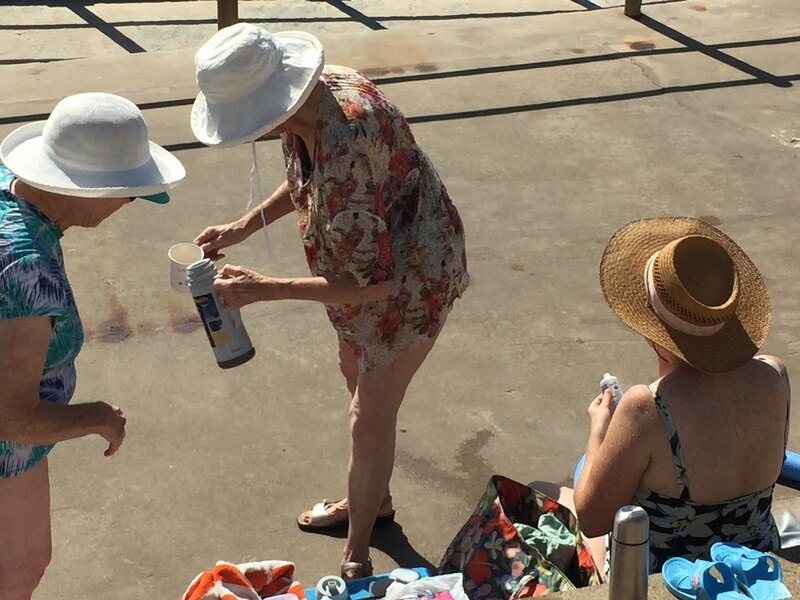 Amongst the surfers, the walkers, the swimmers, the sky and the waves, I noticed this trio of ladies. They were engrossed in the complexities of politely pouring each other a cup of tea. That's it. Simple things done together. That's what I needed to know. Monopoli in summer. Next time I am here, what will I be able to say? I have been learning French for a long time and despite thinking that choosing maths as one of my Uni majors (maths and French) was wise given the dearth of maths teachers at the time that I graduated, it has always been the French that has got me the next job, onto the next adventure, living in the next place and meeting new people. I am competent in French, there is no doubt, but I continue to learn, and enjoy my language learning, every day. My methods are tried and true - watching the French news (a whole lot easier now given that I can replay episodes on my computer, phone or television at any time), getting French email alerts (franceinfo) day and night, reading in French (a random choice of whatever I can lay my hands on from the libraries), communicating with my French friends (I never did think that Instagram and Facebook would work for me but they have proved me wrong) and being alert to any and all expressions, discussions and articles that would make my language more correct, more colloquial, more authentic. I also continue to speak French to my son, which keeps me on my toes but has become such a habit that I'm not sure we'll ever change our ways. 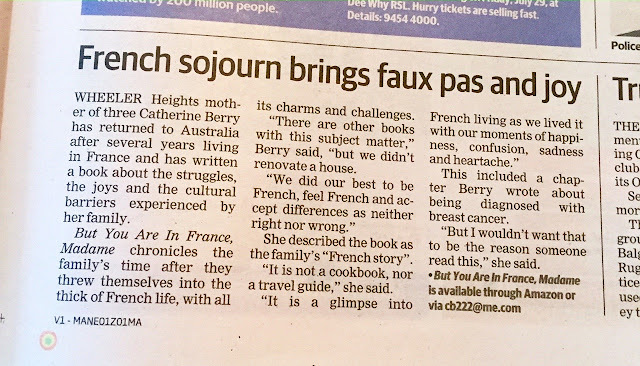 I have loved my role as a French teacher (no, I am not writing a cover letter although re-reading this it looks that way) and this too has continued to reinforce my own skills. So, becoming a learner of a new language is exciting, but strangely disconcerting. I know how far I have to go, I know how much time and passion I will have to dedicate to my learning and, if I am honest, I am slightly trepidatious that it will impact my French (change my accent, interfere with my fluency) even though I know exactly what I would respond to someone voicing this fear to me. In my last blog, I recounted the linguistic surprise that I received at the Italian Consulate, which resulted in me having to take a much quicker journey to speaking Italian than I was expecting. by heading over to Duolingo. My teaching sensors were on high alert from the very beginning...why was I being taught this, what could the pattern be that I was being exposed to by repetition, would I learn which word needed il and which la without a list of masculine and feminine nouns by my side, would the lack of grammatical explanations hinder or help my progress...? It is so very different from the classroom text books which mostly start with simple greetings and progress so very slowly. 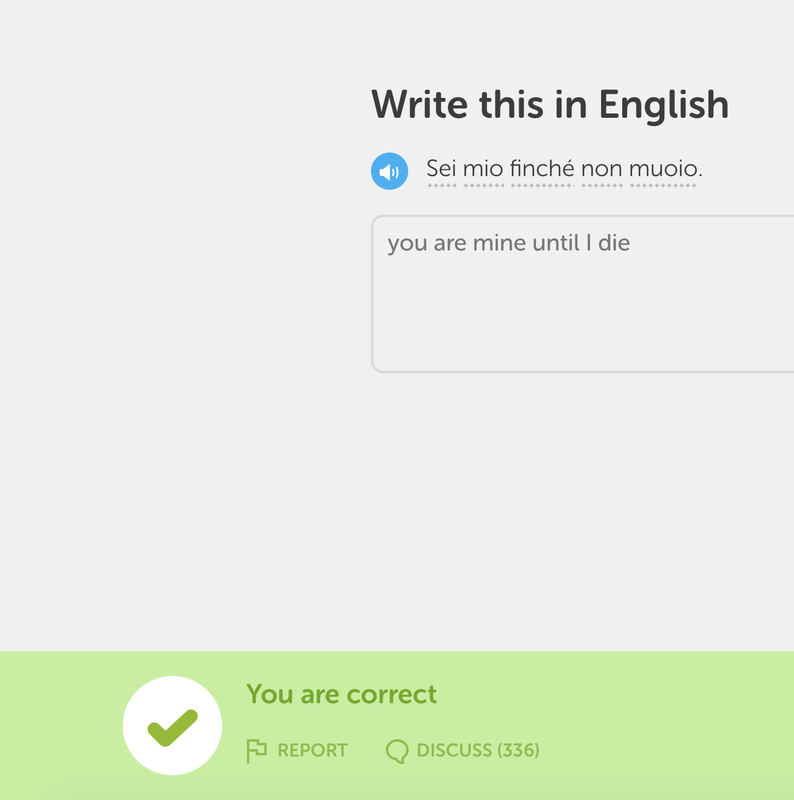 In the first five minutes of Duolingo I was writing, repeating and putting together sentences. I then headed to Babbel. 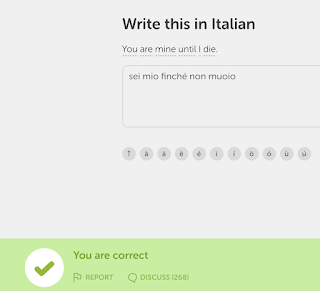 Just the faffing around with setting up the microphone was a hint that it was not going to be the right fit for me, but confirmed when I was made to repeat Grazie, Ciao and Buona notte over and again in the same time that I had put together Io mangio il pane (I am eating the bread) on Duolingo. But, this is not to knock Babbel. 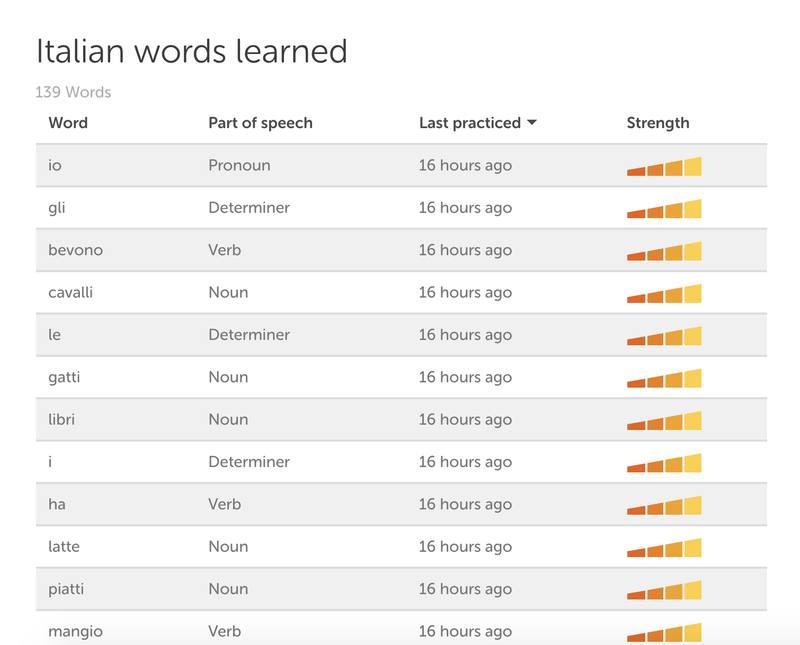 I suspect that the rapid introduction of new words and grammatical ideas (without them being explained explicitly) over on Duolingo would be off-putting to many complete beginners. Fingers crossed I can keep it up... what if this were just the universe's way of letting me know that my next adventure will be more verde, biancho e rosso than bleu, blanc, rouge? 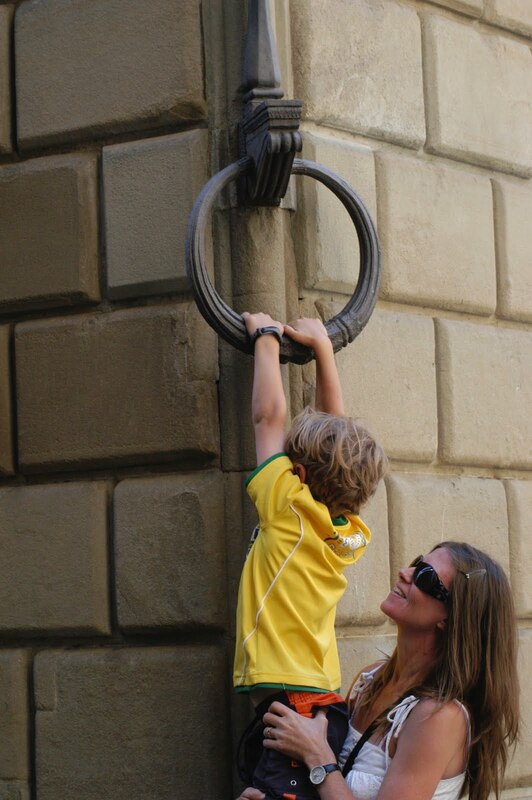 PS I love the photo of my son and I, which seemed to fit today's blog ... in Italy and reaching up, up, up. Io scrivo un libro ... I am writing a book. No, this is not an announcement or something that I've been keeping from you. 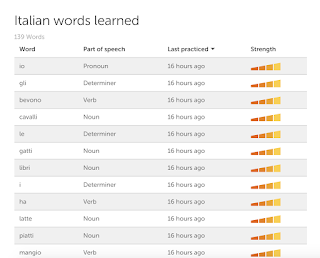 I have to learn Italian - and not just a few random words, or sentences that will get me a shot of coffee in the morning. Let me hasten to add that this was always my intention BUT it would have been nice to have been forewarned before I spent hours preparing my application, paying copious amounts of money getting all manner of certificates and having them apostilled and translated, filling in forms and then paying even more money into foreign bank accounts that a B1-level language test would be mandatory before I could be granted Italian citizenship. Was this information anywhere to be found on the website detailing the process? No. When did this new rule come into play? Early January ... this year! Io sono una donna - but a pretty worn out one at that after this latest revelation. 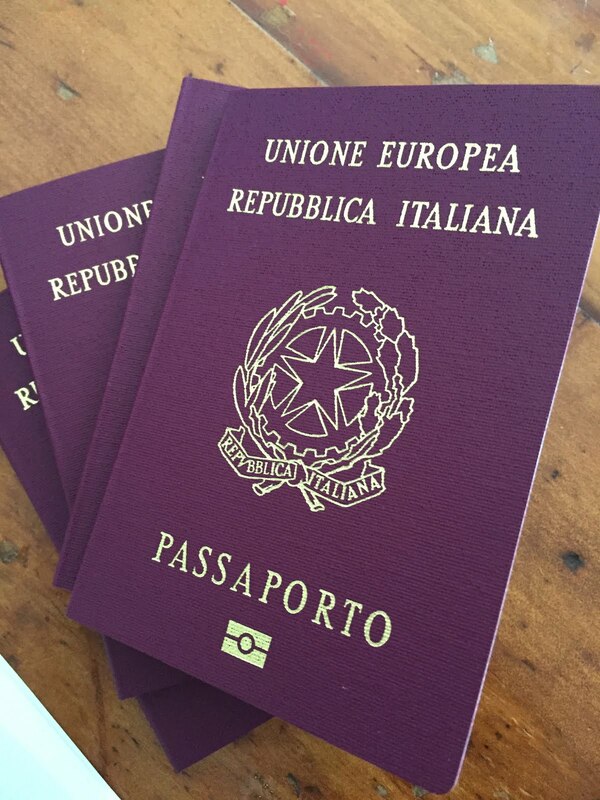 We did have some success, though, at the Italian Consulate Offices this morning where I was greeted with this new linguistic challenge - four new Italian passports for my husband and children. It takes me back ten years to the very up-and-down period before our departure for France. Re-reading the small excerpt from 'But you are in France, Madame' (below) never fails to make me want that all over again. The busyness, the tiredness, the trepidation, the worry that our passports wouldn't come through on time or that we wouldn't have enough money, the awareness that I would need to step up as the only real French speaker, the uncertainty over housing, schooling, work ... I'd take all of that again in a heartbeat knowing what I know now. If you are even semi-seriously contemplating a family adventure like ours, do it ... just do it. And, if you are hesitating and need someone to bounce ideas off, send me a message. I'm always very happy to help. The final weeks before setting off disappeared in an exhausting madness of attempting to keep the lives of our children relatively normal, while completing the ever-expanding list of things to do. The children themselves, aged at that stage 6, 9 and 12, were in a blissful state of incomprehension about their future in a far-away, friendless, non-English-speaking environment and caught up in the excitement of having unusually indulgent parents—both of whom were constantly behaving rather erratically, forgetting to put them to bed or into the bath, and saying weird, unheard-of things like, “Help yourselves to whatever you’d like in the pantry”. And then distractedly, “Certainly”, to their quizzically opportunistic, “Including the lollies?” follow-through. Even the full shelf of lollies, left over from the interminable round of ‘parties with party bags’ that the children had attended, was fair game. Surprisingly, my furtive nightly raids on their bags had not contributed to a significant reduction in the mountain of Minties, Smarties and chocolate bars. The children were obligingly happy to help change that and equally as happy to have packets of chips or spaghetti out of a can for dinner, with an ice cream chaser for dessert. How lucky it was that I could escape the healthy-eating, good-parenting critics, as it all took place in complete anonymity. 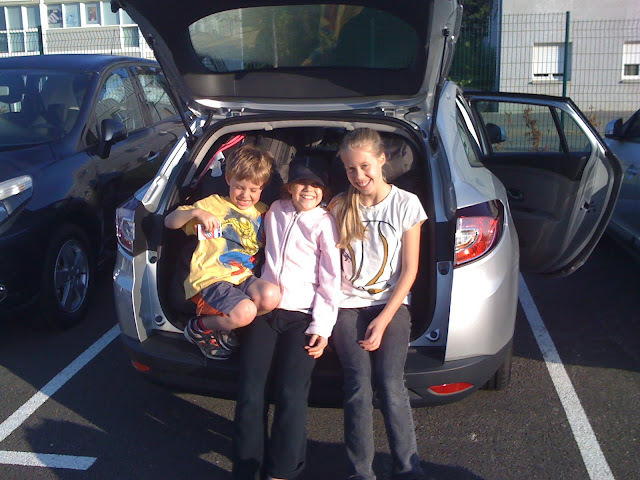 Our arrival in Geneva - after years and years of planning. 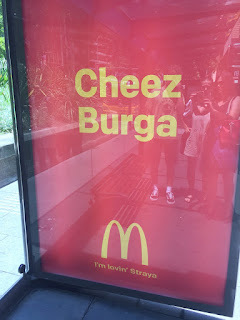 PS I'm not a McDonald's fan, but the billboard next to the bus stop, on the way home, was an emphatic full stop to the whole morning's linguistic story. "Quelqu'un veut un burger au fromage?" Hmm, now what might that be in Italian? And, why, you might ask, am I even going down this Italian passport route? One unfriendly-to-me word - Brexit. We had all been given bright yellow rain jackets to put on; the sort that I wore decades ago over my school uniform but under protest. Visibility was a little further than the railing on the boat, but not far enough to take in the Jurassic Park-lookalike islands, hiding out there somewhere in the fog and slanting rain. 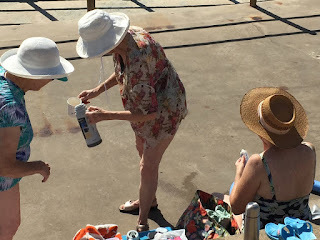 Instead, from my position under cover, I focussed on shaping the stiff, brightly coloured material, which I had stretched over my knees, into channels, and watching the water gush through them before cascading over my bare legs and onto the deck. 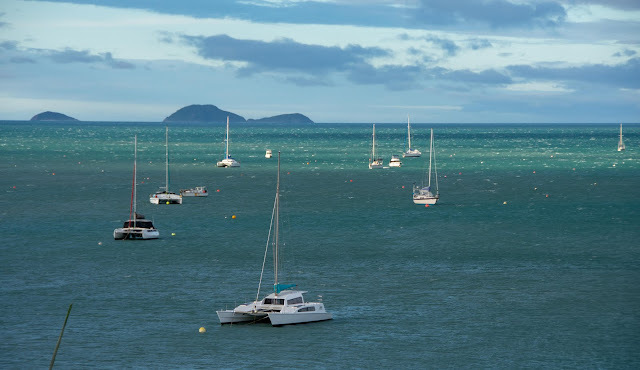 We were in the Whitsunday Islands and, when booking our day's sailing and snorkelling adventure, I had had to put aside my fear of being in the water with deadly jellyfish and sharks, by focussing on the white sandy beaches in the publicity material, the Great Barrier Reef that I would get to see before it whites-out completely and the anticipated pleasures of a gentle breeze in my hair, the sight of an occasional bird and the singing and sighing of the tall ship. I hadn't envisioned dreaming of a hot bath at 8.30 in the morning. She had a history this girl and I was impressed. 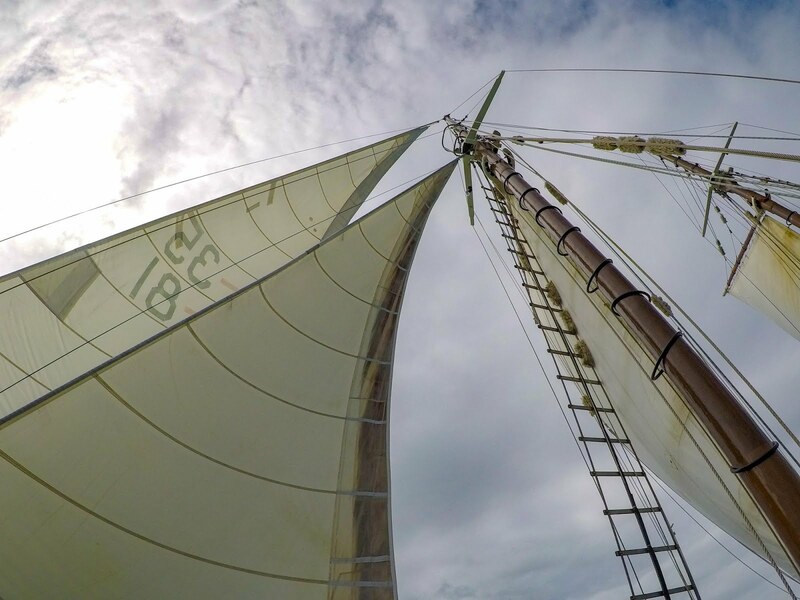 Could the moral of my story be that experience counts, I wondered, as I listened to the crew distract us from the elements by recounting The Derwent Hunter's exploits? Lovingly, and expertly, crafted, she had survived mountainous seas, a trip to Antarctica, racing in a tall-ships' Sydney to Hobart, an inglorious period as a television-series prop and, intriguingly, running packages that probably could not have been posted at a regular post office. Her maker had seen 83 years before he began work on her and, would that he be alive, to hear of her 70-odd-year journey and know that she had surmounted each and every challenge that had been put before her. I know that I felt proud of her achievements and I had nothing to do with her conception. The nearly all-female crew, too, had me beaming. 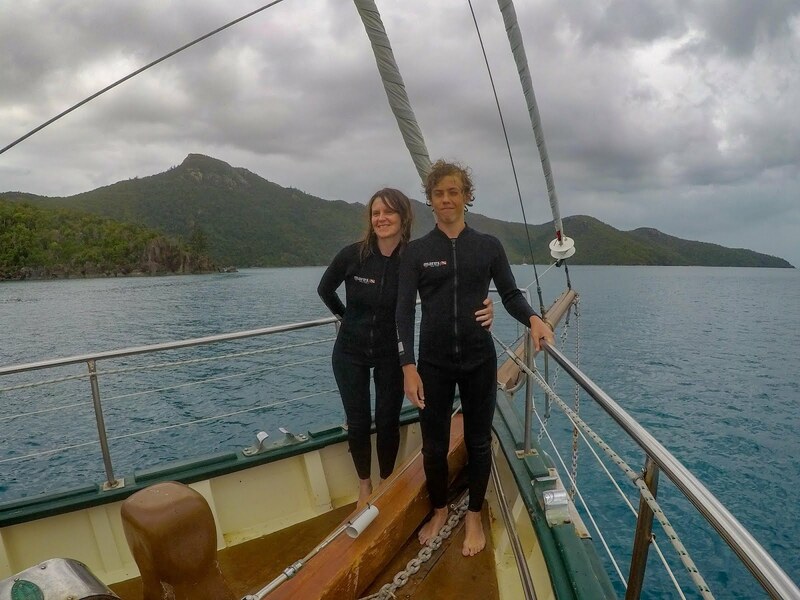 Is it because I am a Mum, is it because I am a teacher or is it just what we should all be delighting in...but for days afterwards, I could not stop talking about the friendly, personable, efficient and knowledgeable way in which they guided us through the day. 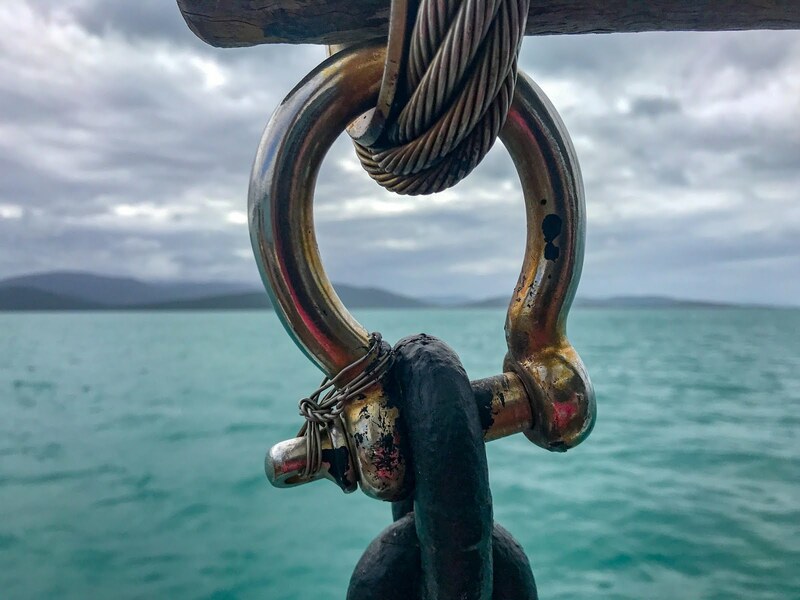 In the middle of the 'show-and-tell' session on our way back to harbour after snorkelling and lunch, the clouds lifted, the sun shone and, when all sails were hoisted, the engine was switched off. Calm, peaceful, warm, blue...until we spotted another tall ship. "It is always a race when there are two boats on the water." I laughed and leant back to enjoy the spectacle, surmising that so often life's lessons come at you in the most unexpected moments. 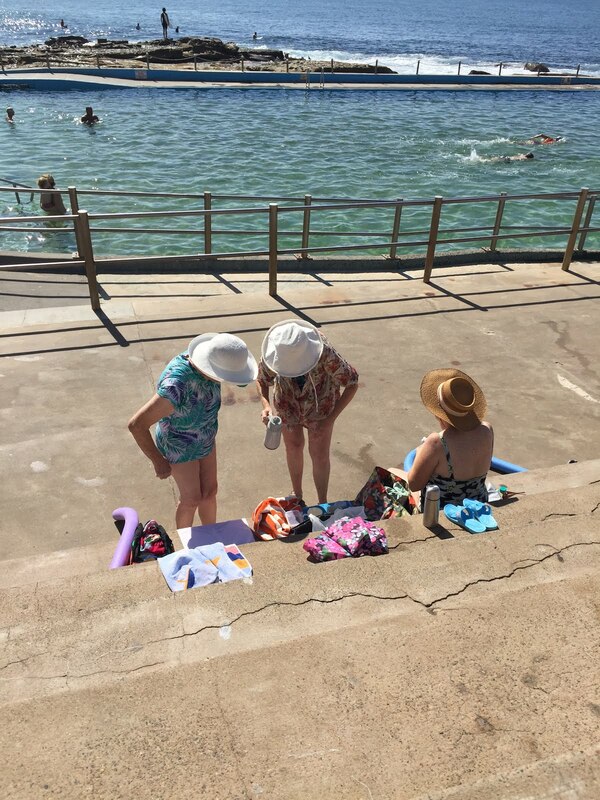 PS We are not in France this Australian summer and, as much as I miss Annecy, the snow and rugging up against the cold, this beach life, I have to admit, has been a lot of fun! If you are a new reader of this blog, and would like to discover how we lived our French family life, here it is - 'But you are in France, Madame' (available in print or e-book). The sun desperately trying to peek through the clouds. She made it.